Madeleines are a French tea cake (thought of as a cookie) that are instantly recognizable with their scalloped shell shape that is ribbed on one side, and smooth, with a hump, on the other. Direct from the oven these buttery sponge cakes have wonderfully crisp edges and such a moist and tender crumb that they are best eaten right away. A dusting of powdered sugar is all that they really need, although you can brush the still warm Madeleines with a tangy lemon glaze. The Madeleine was made famous by Marcel Proust in his novel 'Remembrance of Things Past'. Their origin is a little fuzzy, but it seems to have all started in the French town of Commercy, in the region of Lorraine, during the 18th century. One story is that these tea cakes were served to Stanislaw Lezczynski, Duke of Lorraine, and he liked them so much he named them "Madeleines'' after the girl who made them. When you make Madeleines a sponge-like batter (actually a genoise) is used. And like most sponge batters it starts with a beaten mixture of eggs and sugar into which is added sifted flour. The difference between a regular sponge and a genoise is that we add warm melted butter (can use browned butter) which makes the Madeleines light and tender with a nice buttery flavor. The melted butter needs to be warm, so it does not solidify once it is added to the batter, causing streaks. What makes these little cakes so unique is that they're baked in special oval shaped molds with ribbed indentations that gives them a pretty shell shape. (However, you can use small tarts pans or mini muffin pans.) It is important to properly butter and flour your pans so that the baked Madeleines release easily after baking. 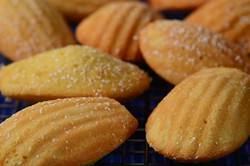 Madeleines are at their best when freshly made. While you can use the batter immediately, you will not get that characteristic "hump", so try to chill the batter at least an hour or two before using. The good part is that the batter can be covered and stored in the refrigerator for about three days, so you don't have to make all the cookies at once. If you want to make Lemon-Poppy Seed Madeleines, add about 1 tablespoon poppy seeds and one teaspoon lemon zest to the batter. And once baked, brush the still warm Madeleines with a lemon glaze, made by stirring together 1/2 cup (60 grams) confectioners (powdered or icing) sugar with about 2 tablespoons fresh lemon juice. Madeleines: In a small saucepan, melt the butter and then keep it warm. In a small bowl whisk together the flour, baking powder, and salt. In the bowl of your electric mixer, or with a hand mixer, beat the eggs and sugars at high speed until the mixture is thick and pale in color (about 5-8 minutes). Beat in the vanilla extract and lemon zest (if using). Then sift about one-third of the flour mixture over the whipped eggs and gently fold in, using a rubber spatula or whisk. Sift and fold in half of the remaining flour, and then sift and fold in the rest. (Do not over mix or the batter will deflate). Then take about 1 cup (240 ml) of the batter and fold it into the warm melted butter. (This lightens the butter making it easier to fold into the batter.) Then, with a spatula, gently fold the butter mixture completely into the egg batter. Cover and refrigerate the batter for at least an hour or two, preferably overnight (can be stored in the refrigerator for up to three days). Remove the pans from the oven and immediately tap each pan against the counter to release the Madeleines. Place Madeleines on a wire rack to cool. Best served immediately but can be stored in an airtight container at room temperature for a couple of days or frozen for up to 1 month. Dust with powdered sugar before serving. Makes about 24 - 3 1/2 inch (8,.5 cm) Madeleines.